12 hours ago I was on Earth. Now I am looking at it from 400 km away, at a speed of 28 000 km/h. Last week on Earth, after leaving the housing complex that hosted my crew for the last two weeks of quarantine, we were surrounded by a crowd of relatives, friends and onlookers who greeted us with excitement (applause, photos, laughter and a group that sang “Volare”). Once again I was wearing my Sokol space suit, as I have done dozens of times in the simulations. Only this time we were actually leaving. On the day of launch I do not feel any difference: it seems strange, but I feel extremely calm, my thoughts are focused – but I know I am happy, and when I see my family on the other side of the glass, my wife, my daughters, my parents and my wife’s family, I tell them that this is a time to celebrate. 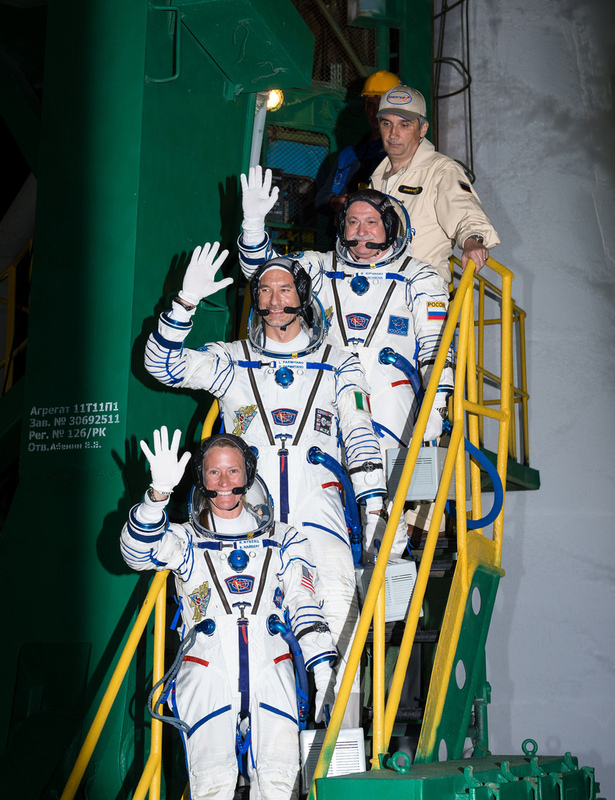 I will not see them for the next six months, but I cannot feel sad – my Soyuz spacecraft is waiting for me. The same buses that transport all Space Station crew since construction began over ten years ago bring us to about 100 meters away from the rocket. It shines, illuminated by dozens of lights and it is an impressive glorious sight. As we climb the rickety elevator that will bring us to the highest point, I cannot help but notice the ice that covers the boosters, filled with fuel so cold that the moisture in the air freezes. 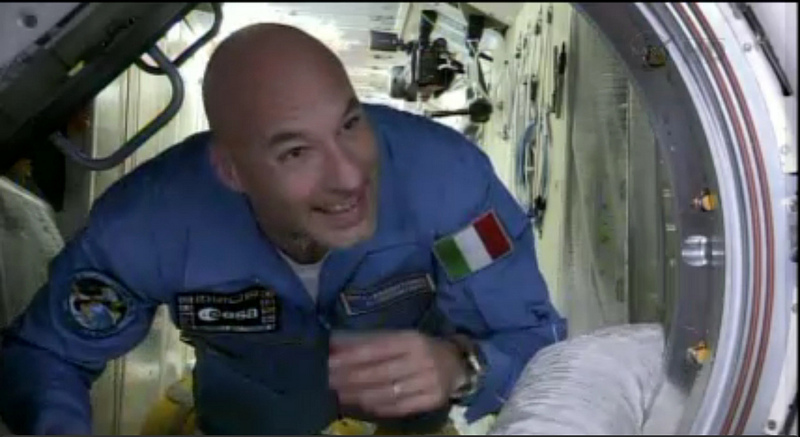 Soon it is time to enter the Soyuz capsule and take our seats. As always, I am the first to enter. I turn on the control panel and the computer and I establish radio contact – I am now in my role, in my world. At this point in time nothing else exists. Like a pilot, when I close the cockpit hatch everything else disappears and I feel at one with the vehicle. Lengthy checks begin but everything is in perfect working order. 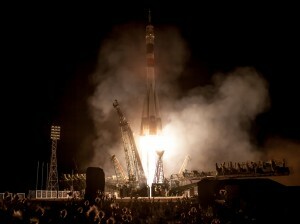 Our Soyuz TMA09-M is ready and I feel it vibrate around and below me, it has a life of its own. During the orbits that follow, we check the ignition of the main engine as we correct our orbit six times. Between two boosts I steal a moment to look outside my window and get a glimpse of Earth. I knew I would be amazed and surprised but it is impossible to imagine the feeling of enchantment as the view leaves me breathless. It is impossible to describe it. After the sixth orbital correction, our activities become hectic as we prepare for the approach and the docking with the International Space Station. 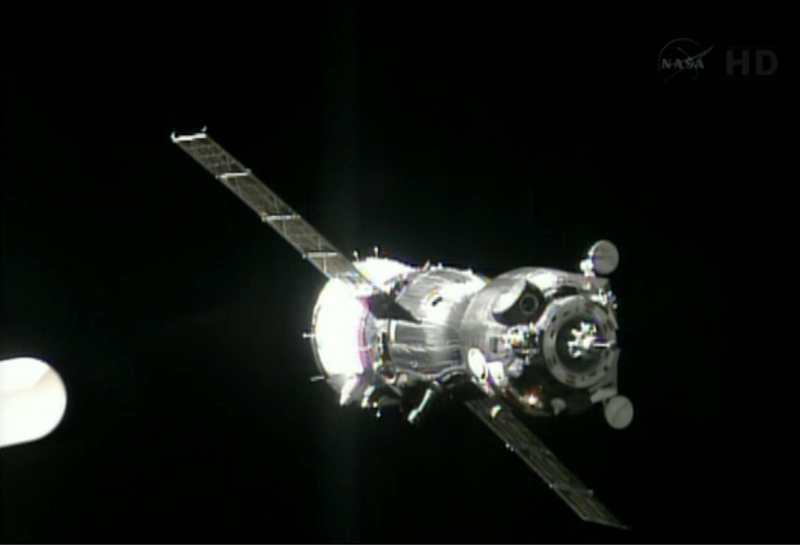 Our TMA-09M spacecraft behaves excellently and we perform a perfect automatic docking. Now I start to feel the fatigue and the accumulation of emotions of the day. I have not slept for 22 hours and this day is not like any other. I do not want to miss even a second so I force myself to stay awake during the operations pressure checks. An hour passes as if it were an instant and it is already time to open the hatch and enter the International Space Station, my home for the next six months. When I see the crew, my joy is overwhelming … but this is perhaps another story. Guardandoti (in fotografia) entrare nella ISS sembri veramente l’uomo più felice del cosmo. nutro una grande stima e una profonda ammirazione per quello che stai facendo,sei uno dei motivi per il quale sono orgoglioso di essere Italiano. Continua cosi e tienici aggiornati sempre . Ti auguro buon lavoro e una buona permanenza sulla ISS. Was the Cupola the first port of call once you got inside the station? I love the way every single astronaut and cosmonaut cannot describe the view of our fragile oasis!! your joy was clearly visible in the video “New crewmates welcomed on Space Station” 🙂 (http://www.youtube.com/watch?v=D72a_H0FDyA) – and that’s understandable! I am rather sure I never looked like that when arriving at the office! Finalmente possiamo goderci il tuo entusiasmo di italiano che lavora (nello spazio)! Grazie Luca, e facci sperare in un avvenire migliore di quello che stiamo vivendo ora. Tutto così magico, avvolgente sembra di essere li a bordo! Grazie per il tuo racconto così appassionante! Che post meraviglioso… Per fortuna che non puoi vedermi: sul mio volto ci sono il sorriso e le lacrime. Nemmeno dopo la seconda EVA. La sua facilità di linguaggio, la sua empatia, il sorriso spontaneo fanno sì che lei arrivi a tutti in maniera contagiosa, perchè in lei sono presenti tutti i sogni ancestrali di ognuno di noi. Perchè lei lassù (come poi dirà in un altra novella di questo blog ) è incontaminato da tutti i flussi negativi che nel mondo ” terrestre” invece ci tangono. I pensieri arrivano sempre e ovunque. Soprattutto quelli positivi.